In addition to mucous casts, just referred to, others of various composition are met with as the result of inflammatory disease of the kidneys. Of these some are composed of epithelial cells in various stages of decay, shed from the inner surface of the urine tubes; others are formed of blood corpuscles either alone or mixed with, or enclosed in, epithelial cells, while others are structureless and wax-like (fig. 143). Fig. 143. - Casts in Horse's Urine. A, Mucous casts. 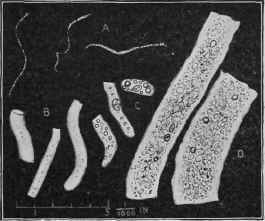 B, Small waxy clear casts, c, Casts with fat and oil globules. D, Large granular casts. Fig. 144. - Crystals of Oxalate of Lime from Horse's Urine. Oxalate Of Lime, although frequently occurring in the urine of healthy horses, is now and again found to exist in large quantities, associated with a disease of an obscure character, to which, for want of a better name, " oxaluria" has been applied. In a case recorded by the late Professor Morton the urine was found to contain this salt in considerable amount (fig. 144). When first examined, Professor Morton says the pulse was found to be thirty-two in a minute, tone feeble, a peculiarly anxious countenance was observed, and a looking from time to time to the loins, with an expression indicative of pain. The appetite was impaired and capricious, although there was but little loss of flesh. On walking the animal out of the stable, considerable languor and listlessness were evinced, and the slightest exertion produced great fatigue. On his being returned to the .stable he immediately placed himself in the position to urinate, and, after making several ineffectual attempts, a few ounces of urine were voided, having a very peculiar smell, and being somewhat viscid. In this case the urine had a light amber colour, and was clear. It gave an acid reaction to test-paper, and its specific gravity was 1.00045. 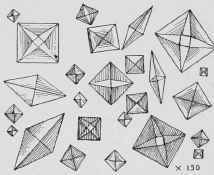 It did not contain albumen, but when examined microscopically was found to contain a large amount of oxalate of lime, in the form of bright octahedral crystals. The presence of oxalic acid in the urine is believed to arise out of some defect in the digestion and assimilation of the food.